Looking for something to sink your teeth into during Chanukah? Try the halachos of chocolate Chanukah gelt and the history of Jews and chocolate. •	Is a beracha achrona recited on hot cocoa and is one allowed to drink hot chocolate before davening? •	What beracha is made on chocolate covered products, such as chocolate covered raisins? •	How is a chocolate machine kashered? •	Does bishul akum apply to chocolate? It is thought that Jews who were outstanding in the chocolate industry in the 18th and 19th centuries in Europe, started the Chanukah chocolate coin custom. 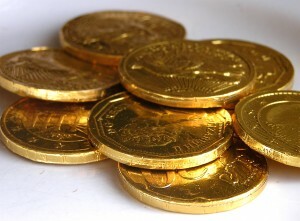 They may have coined the phrase: chocolate Chanukah gelt (=gold). Then into the 20th century we have Loft chocolates who, in the 1920s, produced the now ubiquitous foil-wrapped chocolate coins for Chanukah. Bartons, another Jewish founded and owned chocolate company, then produced not only coins, but little chocolate Maccabees and even latke-shaped chocolates. (The latter didn’t go down well, and slipped into oblivion.) Elite, the Israeli chocolate giant, followed suit along with Carmit and other Israeli manufacturers and today most of those delectable chocolate coins do come from Israel. They are sometimes color coded: gold foil is often milchig, silver foil pareve, but check the label to be sure. Commemorative metal coins were issued in 1958 by the Bank of Israel for use as Chanukah gelt, bringing us full circle back to the minting of coins by the Hasmoneans. Beware, they are not for noshing. It’s not for nothing that those coins bore the image of the same menorah that appeared on Maccabean coins 2,000 years ago. This brings us to the question: how did Chanukah become connected with coins? That is for another posting. Is it like hunting for sport, an activity that even if technically permissible, is something Jews should not want to be involved in? Why does it seem that these questions are left for those who redefined Judaism to Liberal Democrat ideals under the rubric of “Tikkun Olam”? Why can’t we find actual halachic discussion in our community of this kind of issue?